Help that gets to where it’s needed – Rittal Foundation celebrates fifth anniversary | Rittal - The System. Ralf Schneider and his wife Manuela could scarcely believe their eyes when they not only had the lucky ticket number, 12993, in their hands but also saw it displayed on the large screen at the Friedhelm Loh Group’s family-friendly festival. 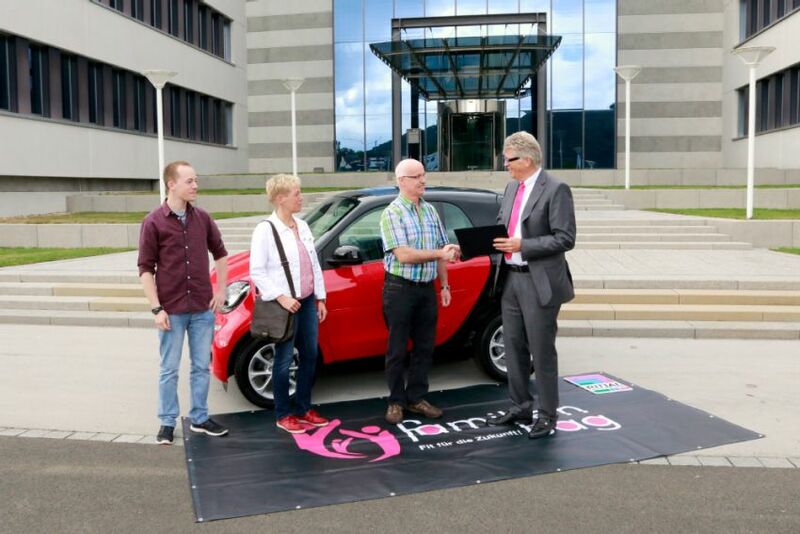 They had won the top prize in the raffle – a brand new, bright red Smart car. “On my way to the stage, all the employees slapped me on the shoulder and congratulated me, including some I didn’t know at all,” says the Rittershausen plant employee, recounting his very own lucky moment. The Rittal Foundation was responsible for this happy occasion. To mark its fifth anniversary, a very special fundraising event was organised that all employees could take part in. 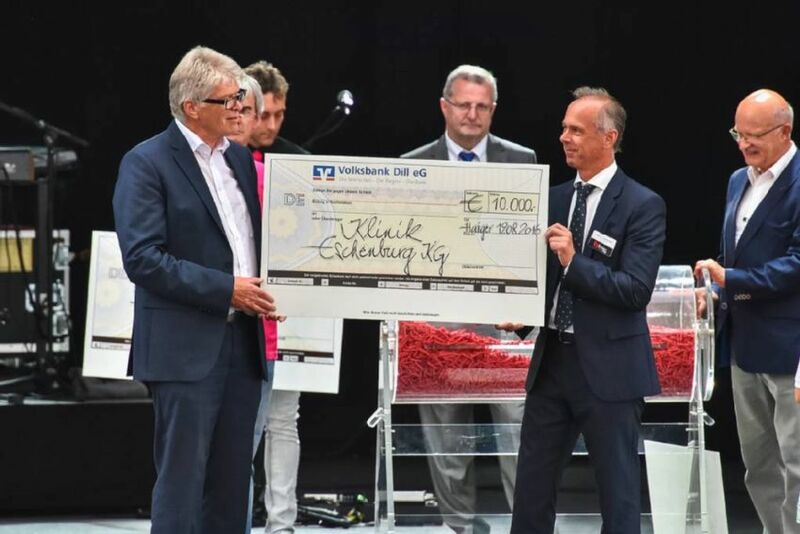 With a large raffle for the approximately 6,500 employees and family members who had come along to the Friedhelm Loh Group family-friendly festival, the proceeds of each ticket the Foundation sold went to projects in the region. This raised over € 20,000, which was topped up to € 30,000 by Dr. Friedhelm Loh, owner and CEO of the Group. Dr. Loh set up the Rittal Founda-tion in 2011 to mark Rittal’s 50th anniversary. Since it was established, the Foundation has funded around 150 projects in the region. As the Rittal Foundation focuses on sustainable development in welfare services, culture and education, the proceeds of the raffle will benefit one project in each of these individual areas – the Eschenburg addiction clinic, the Haiger-based Sing&Act choir and the vocational schools in Dillenburg. After aiding two major projects in the region focusing on culture – one with the Amadeus Junior Akademie in Dillenburg and the other with the Kulturscheune in Herborn – a project in Haiger is now being added. The Sing&Act choir will thus be using the € 10,000 donation to expand its technical facilities and work with young people. The choir, which has won a number of awards, is already collaborating with the Johann-Textor school in Haiger. Modern elements such as dance and beat boxing and music styles such as pop and rock are set to stimulate interest in choral singing in the future, explains Carsten Geiss-Preuschoff, Chairman of Sing&Act e.V. With the special fundraising raffle at the family-friendly festival, the employees of the Friedhelm Loh Group have also sent out a signal for the future. They are committed to helping good causes, and that’s why ten of them have even been able to take home a thank-you present. Ten prizes, ranging from a Smart car to a holiday and a Weber barbecue, went to the lucky winners. The Rittal Foundation is also using the proceeds of around € 3,000 from the “test your strength” stall for projects in the region: “We’ve enjoyed success for 55 years, and I therefore owe a debt of gratitude to all employees,” says Dr. Loh: “I thank the Foundation for helping to make it possible to live and work in our country in peace and freedom.” He also thanked the sponsors for their support in donating a number of prizes for the raffle.